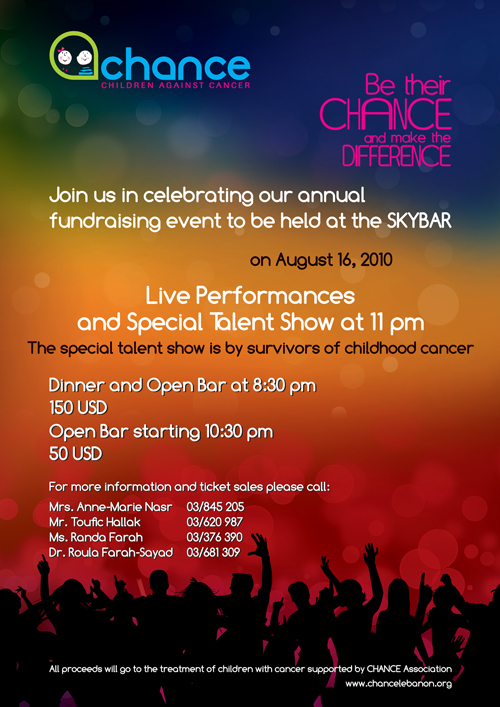 CHANCE (CHildren AgaiNst CancEr Association) will be hosting their annual event at SKYBAR, BIEL on August 16th, 2010. After our great success last year, with over 1000 people attending our glamourous event, our dinner this year will be starring children and adolescents survivors of childhood cancer through a fashion show in collaboration with ESMOD and Mrs Ghada Kazan where these cured children will be heroed through a live testimony by catwalking with local celebrities and esteemed and beloved popular personalities. Mr Maxime Chaaya will host the ceremony along with lovely MTV presenter Mrs Rolla Safa. Live performances exclusive to CHANCE such as a musical show by a lovely little girl with leukemia and her family of musicians, a dazzling violin performance by Habib Alberto and live pop opera singing by Teddy Nasr, winner of the Murex award 2010 for best composer accompanied by Corinne Metni. Dr Roula Farah, CHANCE president will present briefly CHANCE goals and accomplishments.